Explore reefs teeming with soft coral, ragged tooth sharks, fishes, dolphins and whales. 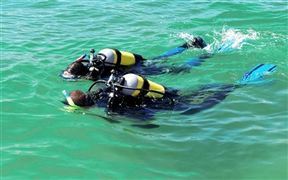 JBay Dive School offers Scuba diving courses, dive charters, dive equipment, sales and air fills. The school can be found on the main beach next to launch site (opposite Training Edge Gym). JBay Dive School is 4.7km from the centre of Jeffreys Bay , the nearest airport 75.9km (Port Elizabeth Airport).